a. Bruce Addison & Joyce Helen (Rowell) Beebe, generation 1, below. "The name Beebe is of great antiquity, being found in various forms of spellings, as far back as Bebi, an Egyptian king of the Second Dynasty, 3000 years B.C. Richard and William de Beebe were of the Royal Guard of William the Conqueror and passed over to England with him and wer granted manors in Warwickshire where the family lived up to the close of the Commonwealth. At East Farndon, England, John Beebe was pastor of the church of St. John the Baptist, prior to 1411. John Beebe (1), from Northamptonshire, migrated to America about 1650. The line runs, Samuel, Thomas, Edward, Thomas T., Thomas William. Thomas T. served as ensign in the Revolution. In the thick of the fight at Bunker Hill, he secured a fine musket which dropped from the grasp of a mortally wounded English soldier. The gun is now in the possession of a descendant in Albany, and also a bugle used in the battle and a saber used by Ensign Thomas T.
Born about 1470 in Kettering, Northamptonshire, England. Died after 1561 in Great Addington, Northamptonshire. Born about 1470 in Kettering, Northamptonshire, England. Married Thomas Bebe about 1498 in Great Addington, Northamptonshire, England. a. Alexander Thomas Bebe: Born 1500 in Kettering, Northamptonshire, England. Died about 1553 in Great Addington, Northamptonshire. Married Elizabeth Hull about 1549 in Great Addington. b. Thomas Alexander Bebe: See generation 14, below. Born about 1535 in Kettering, Northamptonshire, England. Died after 1561 in Great Addington, Northamptonshire. Married Thomas Bebe about 1553.
a. Alexander Thomas Bebe, II: Born about 1555 at Great Addington, Northamptonshire, England. Died there 1623. Married Elizabeth Hull on 3 November 1578 at Stoke Doyle, Northamptonshire. b. Mary Bebe: Born about 1556 in Great Addington, Northamptonshire, England. Died there 1610. Married Thomas Foscutt. c. John Bebe: See generation 13, below. Born about 1560 in Great Addington, Northamptonshire, England. Died there 3 March 1622. Married John Beebe about 1595.
a. John Beebe, Jr.: See generation 12, below. b. Elizabeth Beebe: Born 1596 in Great Addington, Northamptonshire, England. Died 1650.
c. Thomas Beebe: Born 1603 in Northamptonshire, England. Died there. d. Ann Beebe: Born 1605 in Northamptonshire, England. Married John Harris in 1630 in Broughton, Northamptonshire. e. James Beebe: Born 1598 in Broughton, Northamptonshire, England. Died there 24 June 1671.
f. Alexander Beebe: Born 1604 in Buckinghamshire, Northamptonshire, England. g. Margery Beebe: Born about 1608 in Great Addington, Northamptonshire, England. Died 1705 in North America. h. William Beebe: Born 1606. Born about 1600 at Broughton, Northamptonshire, England. Died 18 May 1650 aboard the SS Speedwell, in the Atlantic Ocean while immigrating to America; will made on or prior to that date. Was of yeoman status (next under the rank of gentleman), with adult children, when he left England for North America. Born 1602; daughter of Robert Ladd. Died by spring 1650 in England. Married John Beebe, Jr. in 1627 at Broughton, Northamptonshire, England. (1. Abigail Beebe: Married William Willoughby. (2. Elizabeth Beebe: Born 1657 in Concord Township, Middlesex County, Massachusetts. Died 1759/60 in Groton Township, New London County, Connecticut. (1) Joseph Beebe, Jr.: Born 4 December 1702 at New London, New London County, Connecticut. Died 20 January 1739 at Columbus, Chenango County, New York. Married Elizabeth Camp, daughter of William Camp, on 26 April 1731 at New London. [a. Ira Beebe: Born 6 October 1782 in Pomfret Township, Windsor County, Vermont. Died October 1806 in Washington County, New York; interred Revolutionary Cemetery, Salem Township, Washington County, New York. [b. Polly Beebe: Born 29 October 1778 in Pomfret Township, Windsor County, Vermont. [d. Eli Beebe, Jr.: Born 30 December 1791 in Pomfret Township, Windsor County, Vermont. [e. Elizabeth Beebe: Born 25 August 1793 in Vermont. [2. Ursula Beebe: Born 9 January 1761 at Waterbury, New Haven County, Connecticut. Died 28 September 1846. Married Walter Wooster (b. 7 Jul 1745 at Derby, CT, d. 21 Jul 1829 at Waterbury, CT) on 15 November 1780. [3. Achsa Beebe: Born 9 March 1762 at Waterbury, Connecticut. [4. Armenia Beebe: Born 16 July 1765 at Waterbury, New Haven County, Connecticut. Married Asahel Morgan, son of John Morgan, on 25 September 1776 at Waterbury. [5. Borden Beebe: Born 5 September 1767 at Waterbury, New Haven County, Connecticut. (b) Zeruiah Beebe: Born 1 February 1738 at Lyme, New London County, Connecticut. Died 15 June 1781 at Waterbury, New Haven County, Connecticut. Married Israel Terrill on 9 February 1758. (c) Zera Beebe: (female) Born 2 June 1740 at Lyme, New London County, Connecticut. Died 1 January 1805 at Solon, Cortland County, New York. Married Keziah Warner (b. 6 Oct 1742 at Waterbury, CT, d. abt 1813 at Cazenovia, Madison Co., NY) on 19 March 1761 at Waterbury, New Haven County, Connecticut. (d) Borden Beebe: Born 3 August 1742 at Lyme, New London County, Connecticut. Died June 1760 at Waterbury, New Haven County, Connecticut. (e) Jonathan Beebe: Born 24 September 1745 at Waterbury, New Haven County, Connecticut. Died 25 March 1831. Married Azubah Warner (b. 12 Jul 1740) on 25 August 1767 at Waterbury, New Haven County, Connecticut. (f) David Beebe: Born 12 April 1747 at Waterbury, New Haven County, Connecticut. Died 11 November 1840 at Elyria, Ridgeville Township, Lorain County, Ohio. Married Lydia Terrill (b. 10 Jan 1746 at Waterbury, CT) on 1 February 1768 at Waterbury, New Haven County, Connecticut. (g) Sergeant Seba Beebe: Born 6 April 1749 at Waterbury, New Haven County, Connecticut. Died 26 February 1837 at Beebe Plain, Quebec, Canada. Married Sarah Davis (b. abt 1760 at Westmoreland, VT) on 24 February 1773 at Westminster, Vermont. (h) Simeon Beebe: Born 6 April 1749 at Lyme, New London County, Connecticut. (i) Silas Constant Beebe: Born 15 January 1750 at Waterbury, New Haven County, Connecticut. Married Polly Stephens. (j) Reuben Beebe: Born 28 August 1751 at Waterbury, New Haven County, Connecticut. Died 15 December 1834 at Little Meadows, Susquehanna County, Pennsylvania. Married Eunice Beardslee. (3) Ephraim Beebe: Born 5 May 1712 at New London, New London County, Connecticut. Died 1750-53. Married Thankful Scone on 4 December 1733 at Saybrook, Middlesex County, Connecticut. (4) Stephen Beebe: Born 13 July 1714 at New London, New London County, Connecticut. Married Elizabeth Fergo on 7 December 1737. (5) David Beebe: Born 1716 at New London, New London County, Connecticut. Died 27 November 1810 at Lyme, New London County, Connecticut. Married Sarah Lord (d. 13 Jun 1793). (6) Elisha Beebe: Born 1718 at New London, New London County, Connecticut. Died 16 August 1760. (7) Simeon Beebe: Born 1720 at New London, New London County, Connecticut. Died about 1777 at Waterbury, New Haven County, Connecticut. Married Anne Terrill (b. 16 Jul 1724 at Lyme, New London Co., CT), daughter of George Terrell, on 1 August 1750 at Lyme. (8) Japhet Beebe: (female) Born about 1722. (9) Abigail Beebe: Twin. Born 20 October 1728 at Norwick, New London County, Connecticut. Married Josiah Smithson. (10) Mehitable Beebe: Twin. Born 20 October 1728 at Norwick, New London County, Connecticut. (14) Thaddeus Beebe: Born 1740. (b. Mary Beebe: Born about 1685 at New London, New London County, Connecticut. Died 1 October 1731. Married (1st) John Stedman on 29 July 1706. Married (2nd) Samuel Chapman on 27 October 1725. (c. Stephen Beebe: Born 1688 at New London, New London County, Connecticut. Married Mary Leach, daughter of Thomas Leach, on 16 November 1716. (d. Jerusha Fuller Beebe: Born 1690 at New London, New London County, Connecticut. John Beebe married (2nd) Elizabeth Bond (b. 28 Aug 1659 at Chipping, Lancashire, England, d. 1690 in CT), daughter of Thomas and Anne (Parker) Bond between 1680 and 1690 in New London Township. (1) Martha Beebe: Died 1800. (3) Jane Beebe: Born 1734. Died 1834. (5. Rebecca Beebe: Born about 1665 at New London, New London County, Connecticut. Died March 1689. Married Richard Shaw on 21 July 1688. (6. Rachel Beebe: Born 1665 in Connecticut. Died July 1699 at Westerfield, Harfort County, Connecticut. (7. Joanna Beebe: Born about 1668 at New London, New London County, Connecticut. Married Samuel Whitehead. b. Rebecca Beebe: Born 11 August 1630 at Broughton, Northamptonshire, England. Died 1672 at Norwalk (also seen: Harford) Connecticut. Sailed to North America with her father and 4 siblings in spring, 1650. Married John Ruscoe, son of William and Rebecca (?) Ruscoe, on 2 January 1651 in Hartford Township, Hartford County, Connecticut. c. Samuel Beebe: Twin. See generation 11, below. d. Thomas Beebe: Twin. Baptized 23 June 1633 at Broughton, Northamptonshire, England. Died 1699 in New London Township, New London County, Connecticut. Married Millicent Addis (b. 1633 at Gloucester, MA, d. 1698), daughter of William Addis, in 1655 in New London Township. Sailed to North America with his father and 4 siblings in spring, 1650.
e. Nathaniel Beebe: Baptized 23 January 1635 at Broughton, Northamptonshire, England. Died 17 December 1724 in Stonington Township, New London, Connecticut. Sailed to North America with his father and 4 siblings in spring, 1650.
f. Mary Beebe: Baptized 18 March 1637 at Broughton, Northamptonshire, England. Died 1662 in Hartford Township, Hartford County, Connecticut. Sailed to North America with her father and 4 siblings in spring, 1650.
g. Hannah Beebe: Baptized 23 June 1640 at Broughton, Northamptonshire, England. Appears to have died 1649 or early 1650 in England, since she is not mentioned in her father's will, which was written during his voyage to North America. h. Captain James Beebe: Baptized about 1641 at Broughton, Northamptonshire. Died 22 April 1728 at Danbury, Fairfield County, Connecticut. Sailed to North America with his father and 4 siblings in spring, 1650. Married (1st) Mary Boltwood (d. 19 Aug 1676 at Hadley, Hampden Co., MA), daughter of Robert and Mary (?) Boltwood, on 24 October 1667/68 at Hadley, Massachusets. Married (2nd) Sarah Benedict on 19 December 1679 at Norwalk, Connecticut. Married (3rd) Rebecca Beardsley after 1704. Twin. Baptized 23 June 1633 at Broughton, Northamptonshire, England. Died before 6 April 1712 on Plum Island, Southold Township, Suffolk County, New York. Apparently immigrated to America with his brother, John, III, prior to Spring 1650, when his father and other siblings made the voyage. Settled in Colchester Township, New London County, Connecticut. Born 1639 at New London, New London County, Connecticut; adopted daughter of William and Agnes (Douglass) Keeney. Died 9 May 1725 in Colchester Township, New London County, Connecticut; interred 10 May 1725. Married Samuel Beebe in 1662 on Plumb Island, Southold Township, Suffolk County, New York. (1. Samuel John Beebe, Jr.: Born about 1660. Probably moved to Plum Island, Southold Township, Suffolk County, New York. (2. Susannah Beebe: Born about 1663. (a. Joseph Beebe: Born 1686 in New London Township, New London County, Connecticut. (b. Samuel Beebe: Born 11 September 1687 in New London Township, New London County, Connecticut. (c. Mary Beebe #1: Born 1688 in New London Township, New London County, Connecticut. Died there March 1723. Married James Beebe. (d. Lydia Beebe: Born 1689 in New London Township, New London County, Connecticut. (e. Stephen Beebe: Born 10 September 1691 in New London Township, New London County, Connecticut. Died there 18 November 1734. (f. Mary Beebe #2: Born 1692 in New London Township, New London County, Connecticut. Died there 22 March 1715. Married (?) Wheeler. (g. William Beebe, II: Born 15 January 1704 in Colchester Township, New London County, Connecticut. Married Jerusha (Rogers) Beebe, daughter of James and Uriah (?) Rogers, on 9 June 1725 in New London Township, New London County. (h. Guy Beebe: Born 1707 in New London Township, New London County, Connecticut. Died there 22 March 1715. (1). Hannah Beebe: Born 27 November 1730. Died 26 March 1768 at New London, New London County, Connecticut. Married her 2nd cousin, Daniel Beebe, paragraph 2 of generation 8, below, on 10 January 1751. William S. Beebe married (3rd) Hannah Rogers (b. 1669 in New London Twp, New London Co., CT) after 1715. (4. Agnes Beebe: Born 17 June 1667 in New London Township, New London County, Connecticut. Died there 7 June 1748. Married John Daniels on 3 December 1685 in New London Township. (5. Nathaniel Beebe: Born about 1668 in New London Township, New London County, Connecticut. Died there after 1722. Married Elizabeth Wheeler about 2 July 1697 in New London Township. (6. Susanna "Ann" Beebe: Born about 1672 (also seen b. 1655 at New London). (7. Jonathan Beebe: See generation 10, below. (8. Mary Beebe: Born about 1678. Married Aaron Fountain. (9. Thomas Beebe: Born about 1682 in New London Township, New London County, Connecticut. Married Anna Hobson on 17 December 1707 at New London. Born 1642; daughter of William and Agnes (Douglass) Keeney. Married Samuel Beebe in 1660 in New London Township, New London County, Connecticut. On 8 May 1716 was a widow of Cholchester Township, New London County, Connecticut. Born 19 August 1674 in New London Township, New London County, Connecticut. Died 12 October 1761, age 87, in East Haddam Township, Middlesex County, Connecticut; interred there in Long Pond Cemetery. As early as 1704 moved to Millington, East Haddam Township, Connecticut. Born 9 January 1671/72 in Lyme Township, New London County, Connecticut; daughter of Wolstan and Hannah (Briggs) Brockway. Died 5 April 1756. Married Jonathan Beebe before 1693 in New England. (1. Jonathan Beebe, Jr.: See generation 9, below. (2. William Beebe: Born about 1700 in Connecticut (also seen: b. 1706 at East Haddam, Middlesex Co., CT). (3. Jerusha Beebe: (also seen: Joshua) Born 1712 in New London Township, New London County, Connecticut. Died 1797 in Ludlow, Massachusetts. Married (?) Fuller. (4. Caleb Beebe: Born about 1717. Born about 1679. Married Jonathan Beebe, Sr. on 4/11 October 1759 at Old Saybrook, Middlesex County, Connecticut, when her residence was Millington, East Haddam Township, Middlesex County, and when both were 80 years old. Born about 1694 at New London, New London County, Connecticut (also seen: b. East Haddam, Middlesex Co., CT). Died about 1784 in East Haddam Township, Middlesex County, Connecticut. Initially resided at New London, New London County, Connecticut. Subsequently resided in East Haddam Township, Middlesex County, Connecticut. Baptized 4 August 1700 in Fairfield County, Connecticut; daughter of Peter and Hannah (Couch) Coley. Died . (1. Jonathan Beebe: Born about 1720 in East Haddam Township, Middlesex County, Connecticut. (2. David Beebe: Born 1724/23 in East Haddam Township, Middlesex County, Connecticut. Died 27 November 1810 in Lyme Township, New London County, Connecticut. Married Sarah Lord on 29 May 1754 in Connecticut. (3. Samuel Beebe: Born 1726 in East Haddam Township, Middlesex County, Connecticut. Died 1 October 1786 in Wilbrahm Township, Hampden County, Massachusetts. Married Martha Stewart on 19 September 1751 at Millington Church, East Haddam. (4. Daniel Beebe: See generation 8, below. (5. Ebenezer Beebe: Born 1732 in East Haddam Township, Middlesex County, Connecticut. (6. Hanna Beebe: Born 1726 in East Haddam Township, Middlesex County, Connecticut. (7. Rachel Beebe: Born 4 April 1731 in East Haddam Township, Middlesex County, Connecticut. (8. Joshua Beebe: Born 16 September 1733 in East Haddam Township, Middlesex County, Connecticut. (9. Elizabeth Beebe: Born 11 July 1736 in East Haddam Township, Middlesex County, Connecticut. Probably born 1728 in East Haddam Township, Middlesex County, Connecticut; baptized 17 November 1728 in Fairfield County, Connecticut. Died before 16 November 1795 in Longmeadow Township, Hampden County, Massachusetts. Resided in East Haddam Township, Connecticut when married in 1751. After marriage moved to New London, New London County, Connecticut. In the late 1770s moved to Wilbraham, Massachusetts. Then moved to Longmeadow, Massachusetts. Born 27 November 1730 in East Haddam Township, Middlesex County, Connecticut; daughter of Ezekial and Hannah (?) Beebe of East Haddam Township. Died 26 March 1768 at New London, New London County, Connecticut. Married her 2nd cousin, Daniel Beebe on 10 January 1751 at New London. b. Eli/Ely Beebe: See generation 7, below. c. Hannah Beebe: Born 14 February 1755 at New London, New London County, Connecticut. d. Zerviah Beebe: Born 5 April 1757 at New London, New London County, Connecticut. e. Mary Cooley Beebe: Born 18 July 1759 at New London, New London County, Connecticut. f. Jemima Beebe: Born 10 July 1761 at New London, New London County, Connecticut. Born 21 April 1753 at New London, New London County, Connecticut. Died 18 July 1831, probably at Cazenovia, Madison County, New York; interred New Woodstock Cemetery, Madison County. Employed as a farmer. Veteran of the American Revolutionary War; enlisted 4 May 1775 for a term of 3 months and 5 days in Captain Paul Langon's Company within Colonel Timothy Danielson's Regiment. About 1773 moved to Wilbraham. After marriage moved to North Adams, Berkshire County, Massachusetts. About 1783 moved to Tinmouth, Rutland County, Vermont. In 1807 sold his farm to Ebenezer Holms and moved to Cazenovia, Madison County, New York. Baptized 10 August 1760 at New London, New London County, Connecticut; daughter of Stephen and Patience (?) Clay of North Adams, Berkshire County, Massachusetts. Died 29 September 1821 at Cazenovia, Madison County, New York; interred with Ely. Married Ely Beebe on 6 April 1776 at North Adams (also seen: m. Waterbury), Connecticut. a. Polly/Sally Beebe: Born 29 October 1778 in (probably North Adams) Berkshire County, Massachusetts. Died 1816. Married Ezra Wood. b. Parley Beebe: Born about 1780 in (probably North Adams) Berkshire County, Massachusetts Died 19 March 1846 at Brady, Kalamazoo County, Michigan. Married Polly Spinks on 20 December 1806 at Tinmouth, Rutland County, Vermont. c. Eli Putnam Beebe, Jr.: Born 6 March 1782 at North Adams, Berkshire County, Massachusetts. Died 1863 at Imlay City, Lapeer County, Michigan. Married Sally Ann Train (b. 11 Nov 1780 at Gerry Athol, MA, d. before 1850 at Otselic, NY), daughter of Isaac and Elizabeth (Cummings) Train, on 3 April 1803 at Tinmouth, Rutland County, Vermont. d. Charles Beebe: See generation 6, below. (2. Chester Clinton McClure: Born 6 March 1812. Died 22 March 1901, age 89; interred Springville, Erie County, New York. Indentured to Roswell Barber as a servant/apprentice. (3. Martha M. McClure: Born 14 February 1814. Died 26 June 1844, age 70, at Baraboo, Sauk County, Wisconsin. f. Dolly Beebe: Born about 1784 in (probably North Adams) Berkshire County, Massachusetts. Married Abner Pratt. g. Rhoda Beebe: Born in (probably North Adams) Berkshire County, Massachusetts. Died 11 March 1839. Born . Died . Married Ely Beebe between 1821 and 1824. Born 9 October 1788 at North Adams, Berkshire County, Massachusetts. Died 16 October 1874. In March 1815 moved his family by ox-drawn sled to New York State. 1860 US Census: Charles Beebe, age 71 (b. NH) and employed as a farmer, was heading a household in Freedom Township, Cattaraugus County, New York. His real estate was valued at $6,000 and his personal property was valued at $400. The household also included his wife, Elizabeth Beebe, age 64 (b. NH); and daughter, Edner J. Beebe, age 26 (b. NYS). Apparently under the same roof, his sons, Wellington Beebe, age 21 (b. NYS) and Charles Beebe, Jr., age 43 (b. NYS) were also heading households. Born 12 March 1795 in Greenwich Township, Hampshire County, Massachusetts; daughter of Isaac (b. 22 May 1759 at Adams, Ma, d. 19 Aug 1843 at Urbana, NY) and Elizabeth (Cummings) Train (d. 18 Jan 1857). Died 25 March 1881. Elizabeth's father, Isaac Train, was a veteran of the Revolutionary War, for which he received a federal pension. Married Charles Beebe on 19 August 1811.
a. Hiram Beebe: See generation 5, below. b. Eliza Ann Beebe: Born 11 January 1815 at Cazenovia, Madison County, New York. Died 6 October 1851 at Centerville, Davis County, Utah. Married Nathan Calhoun Cheney (b. 11 Feb 1811 at Chesterfield, NH, d. 10 Feb 1852 at Centerville, Davis Co., UT), son of Ebenezer and Lydia (Calhoun) Cheney, on 22 April 1834 at Sandusky, Cattaraugus County, New York. c. Charles Beebe, Jr.: Born 27 January 1817 at Cazenovia, Madison County, New York. Died 29 March 1890 at Sandusky, Cattaraugus County, New York. 1860 US Census: Charles Beebe, Jr., age 43 (b. NYS) and employed as a farmer, was heading a household in Freedom Township, Cattaraugus County, New York. His real estate was valued at $4,490 and his personal property was valued at $1,050. The household also included his wife, Harriett Beebe, age 31 (b. NYS); daughter, Marian A. Beebe, age 12 (b. NYS); son, Franklin Beebe, age 11 (b. NYS); daughter, Vallet C. Beebe, age 8 (b. NYS); daughter, Ella A. Beebe, age 5 (b. NYS); and son, Augustus E. Beebe, age 2 (b. NYS). Appears to have resided under the same roof as his parents and brother, Wellington. Charles Beebe, Jr. married Harriet N. Mead (b. 25 May 1828 at Conington, Wyoming Co., NY, d. 14 Sep 1888 at Sandusky, Cattaraugus Co., NY), daughter of Guy and Laura (White) Mead, on 23 February 1847 at Sandusky, Cattaraugus County, New York. d. Florilla Beebe: Born 1 October 1819 at Arcade, Wyoming County, New York. Died 11 February 1878. Married Isaac T. Wheeler (b. 23 Sep 1812 at Wolcott, Wayne Co., NY, d. 28 Feb 1889 at Sandusky, Cattaraugus Co., NY) on 12 August 1839.
e. Harrison Beebe: Born 1 May 1822 at Cazenovia, Madison County, New York. Died 5 December 1881 at Sandusky, Cattaraugus County, New York. f. Darius Beebe: Born 24 August 1824 at Freedom, Cattaraugus County, New York. Died 26 March 1880 at Kalamazoo, Michigan. Married Jane Marion Cheney (b. 1 Oct 1827 at Freedom, Cattaraugus Co., NY, d. 27 Oct 1886 at Rio, WI), daughter of Josiah and Harriet (Scott) Cheney, on 10 October 1854.
g. Lucretia Beebe: Born 18 April 1827 at Arcade, Wyoming County, New York. Died 1 February 1878. Married Spencer Weir. h. DeWitt Clinton Beebe: Born 22 October 1829 at Arcade, Wyoming County, New York. Died 10 May 1887. Married Azelia Cook (b. Sardinia, NY). i. Edna Jane Beebe: Born 28 March 1834 at Arcade, Wyoming County, New York. Died 23 September 1887.
j. Frances M. Beebe: Born 19 February 1837 at Arcade, Wyoming County, New York. Died 11 April 1870. Married Walter L. Cheney (b. abt 1837), son of Josiah and Harriet (Scott) Cheney. k. Wellington Elmer Beebe: Born 28 January 1839 at Sandusky, Cattaraugus County, New York. Died 31 October 1905. 1860 US Census: Wellington Beebe, age 21 (b. NYS) and employed as a farmer, was heading a household in Freedom Township, Cattaraugus County, New York. The household also included his wife, Ellen Beebe, age 21 (b. NYS). Appears to have resided under the same roof as his parents and brother, Charles. 1880 US Census: Wellington Beebe, age 41 (b. NYS; parents b. VT) and employed as a cheese dealer, was heading a household in the Village of Arcade, Wyoming County, New York. The household also included his wife, Ellen A. Beebe, age 41 (b. NYS; parents b. NYS); son, Dana E. Beebe, age 18 (b. NYS), single, and in school; and daughter, Bertha E. Beebe, age 9 (b. NYS). (1. Dana E. Beebe: Born about 1861 in New York. (2. Bertha E. Beebe: Born about 1871 in New York. Wellington Beebe married (2nd) Ella Louise Colburn (b. 24 May 1862 at Collins Center, NY, d. 22 Mar 1939 at East Aurora, NY) about 1889. Born 5 December 1812 at Cazenovia, Madison County, New York. Died 27 September 1885 at Sandusky, Freedom Township, Cattaraugus County, New York; interred Sandusky Cemetery. 1870 US Census: Hiram Baba, age 55 (b. NYS) and employed as a retail merchant, was heading a household in the Village of Sandusky, Freedom Township, Cattaraugus County, New York. His real estate was valued at $5,000 and his personal property was valued at $3,000. The household also included his daughter, Louisa Beebe, age 34 (b. NYS); Florence Baba, age 19 (b. NYS); son, Harrson Baba, age 23 (b. NYS) and employed as a farmer; and son, Marcus Baba, age 16 (b. NYS). 1875 NYS Census: Hiram Beebe, age 59 (b. Madison Co., NY) and employed as a merchant, was heading a household in Freedom Township, Cattaraugus County, New York. The household also included his daughter, Louisa Beebe, age 38 (b. Cattaraugus Co., NY), son, Harrison Beebe, age 28 (b. Cattaraugus Co., NY) and employed as a farmer; and son, Marcus Beebe, age 20 (Cattaraugus Co., NY). 1880 US Census: Hiram Beebe, age 64 (b. NYS; parents b. VT), widowed, and employed as a merchant, was heading a household in the Village of Sandusky, Cattaraugus County, New York. The household also included his daughter, Louisa Beebe, age 41 (b. NYS); son, Harrison Beebe, age 33 (b. NYS) and employed as a farmer; daughter-in-law, Jane Beebe, age 23 (b. England; parents b. England); boarder, John Evans, age 18 (b. NYS; parents b. Wales) and employed as a clerk in a store; and boarder, Albert Barnett, age 20 (b. NYS; parents b. NYS) and employed as a clerk in a store. Born about 1812 at Sandusky, Cattaraugus County, New York; daughter of Jacob and Molly (?) Jackson. Died there 3 November 1865; interred there. Married Hiram Beebe about 1834.
a. Louisa Beebe: Born 6 August 1835 in the Village of Sandusky, Freedom Township, Cattaraugus County, New York. b. Lavisa Beebe: Born 6 August 1835 in the Village of Sandusky, Freedom Township, Cattaraugus County, New York. Died 24 September 1879. Married Maynard Lanckton. c. Mary Jane Beebe: Born about 1837 in the Village of Sandusky, Freedom Township, Cattaraugus County, New York. Died young. d. Frances Marion Beebe: Born about 1839 in the Village of Sandusky, Freedom Township, Cattaraugus County, New York. Died young. e. Addison Jackson Beebe: See generation 4, below. f. Harrison Charles Beebe: Born 16 February 1846 in the Village of Sandusky, Freedom Township, Cattaraugus County, New York. Died 30 June 1926. Married Jane Morse (b. Aug 1862 at Penbrokshire, Wales, d. May 1942 at Perry, NY) on 5 April 1880 at Sandusky, Cattaraugus County, New York. g. Florence A. Beebe: Born 26 November 1850 in the Village of Sandusky, Freedom Township, Cattaraugus County, New York. Died 13 April 1936. Married John P. Meyers about 1870.
h. Marcus P. Beebe: Born 23 June 1854 in the Village of Sandusky, Freedom Township, Cattaraugus County, New York. Died 11 April 1914 at Ipswich, South Dakota. Married Leota Frances Fuller, daughter of George A. Fuller. Born 5 September 1842 in the Village of Sandusky, Freedom Township, Cattaraugus County, New York. Died 4 November 1907; interred Sandusky Cemetery, Freedom Township, Cattaraugus County, New York. 1870 US Census: A. J. Beebe, age 28 (b. NYS) and employed as a retail merchant, was heading a household in the Village of Pike, Wyoming County, New York. His personal property was valued at $2,000. The household also included his wife, Mary W. Beebe, age 22 (b. NYS), and John Myers, age 27 (b. NYS) and employed as a clerk in a store. 1880 US Census: Adison J. Beebe, age 37 (b. NYS; parents b. NYS) and employed as a dry goods merchant, was heading a household in Pike Township, Wyoming County, New York. The household also included his wife, Mary Beebe, age 31 (b. NYS; parents b. NYS); son, Wilford Beebe, age 6 (b. NYS); son, Rolland Beebe, age 4 (b. NYS); and father-in-law, Wilford Kenney, age 59 (b. NYS; father b. MA; mother b. VT) and employed as a farmer; and mother-in-law, Ruth Beebe, age 58 (b. NYS; parents b. NYS). 1900 US Census: Addison J. Beebe, age 57 (b. Sep 1842 in NYS; parents b. NYS) and employed as a dry goods merchant, was heading a household in the Village of Arcade, Arcade Township, Wyoming County, New York. The household also included his wife of 30 years, Mary H. Beebe, age 53 (b. Jan 1847 in NYS; parents b. NYS), who had had 2 children, both still alive; son, Wilford K. Beebe, age 26 (b. Feb 1874 in NYS), single, and employed as a dry goods merchant; son, Rolland H. Beebe, age 24 (b. Jan 1876 in NYS), married, and employed as a bookkeeper in a bank; and daughter-in-law, Eunice Beebe, age 20 (b. Sep 1879 in NYS; parents b. NYS), who had had no children. Born 31 January 1847 at Rushford, Allegany County, New York; daughter of Caleb Wilford (b. abt 1821 in Allegany Co., NY) and Ruth (?) Kenney. Died 13 April 1939 in Arcade Township, Wyoming County, New York. Married Addison Jackson Beebe on 16 September 1869. 1850 US Census: Caleb W. Kinny, age 29 (b. NYS) and employed as a farmer, was heading a household in Rushford Township, Allegany County, New York. The household also included his wife, Ruth Kinny, age 28 (b. NYS); and daughter, Mary Kinny, age 3 (b. NYS). Of interest, his next door neighbor was the household headed by his mother-in-law, Mary Williston (see next). 1850 US Census: Mary Williston, age 83 (b. NH), was heading a household in Rushford Township, Allegany County, New York. The household also included Leverett Woods, age 33 (b. NYS) and employed as a farmer, whose real property was valued at $2,000. The household also included Ann Woods, age 31 (b. England); and Oliver Woods, age 9 (b. NYS). 1855 NYS Census: C. W. Kenney, age 34 (b. Allegany Co., NY) and employed as a farmer, was heading a household in Rushford Township, Allegany County, New York. He had resided in Allegany County his entire life. His house was valued at $500. The household also included his wife, Ruth Kenney, age 33 (b. Monroe Co., NY), who had resided in Allegany County for 20 years; daughter, Mary Kenney, age 8 (b. Allegany Co., NY), who had resided in Allegany County her entire life; and grandmother, Mary Williston, age 89 (b. VT), who had resided in Allegany County for 28 years. 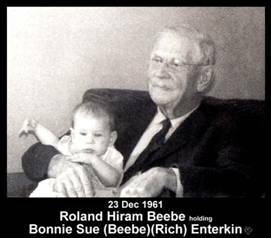 b. Roland Hiram Beebe: See generation 3, below. Born 25 January 1876 at Pike, Wyoming County, New York. Died December 1972, age 96, in Freedom Township, Cattaraugus County, New York; interred Sandusky Cemetery. 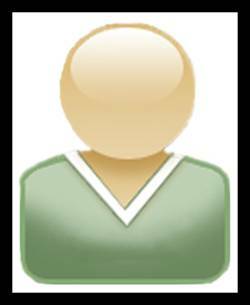 Resided last in Erie County, New York. 1900 US Census: Resided with Eunice in the household headed by his father in the Village of Arcade, Arcade Township, Wyoming County, New York. 1910 US Census: Roland H. Beebe [could be confused with "Bube"], age 34 (b. NYS; parents b. NYS) and employed as a retail merchant, resided in the household headed by his father-in-law, Russell S. Wheeler, age 56 (b. NYS; parents b. NYS), with no occupation recorded, in the Village of Arcade, Arcade Township, Wyoming County, New York. The household also included Russell's wife of 32 years, Alice E. Wheeler, age 51 (b. NYS; parents b. NYS), who had had 1 child, still living; Russell's daughter and Roland's wife of 12 years, Eunice M. Beebe, age 30 (b. NYS), who had had 1 child, still living; Russell's grandson, Donald W. Beebe, age 9 (b. NYS); and Russell's father-in-law, Plinney A. Warren, age 80 (b. NYS; parents b. VT) and widowed, with no occupation recorded. 1915 NYS Census: Raland Beebe, age 39, was heading a household in Arcade Township, Wyoming County, New York. 1920 US Census: Rollin Beebe, age 44 (b. NYS; parents b. NYS) and employed as a banker (business in west), was heading a household on Maple Street in the Village of Arcade, Arcade Township, Wyoming County, New York. The household also included his wife, Unice Beebe, age 41 (b. NYS; parents b. NYS); and son, Donald Beebe, age 19 (b. NYS) and single. 1930 US Census: Roland Beebe, age 54 (b. NYS; parents b. NYS), with no occupation recorded, was heading a household in the Village of Arcade, Arcade Township, Wyoming County, New York. His home was valued at $10,000 and he was married 1st at age 21. The household also included his wife, Eunice Beebe, age 50 (b. NYS; parents b. NYS), who married 1st at age 18. 1940 US Census: Roland Beebe, age 64 (b. NYS) and employed as a real estate broker, was heading a household in the Village of Arcade, Arcade Township, Wyoming County, New York. His home was valued at $5,000 and he had completed 2 years of college. He resided in the same house in April 1935. The household also included his wife, Eunice Beebe, age 60 (b. NYS), who had completed 2 years of high school. Born 2 September 1879 in Wethersfield Township, Wyoming County, New York; daughter of Russell S. (b. 1854, d. 1918) and Alice "Allie" E. (Plinney) Wheeler. Died 1955; interred Sandusky Cemetery, Freedom Township, Cattaraugus County, New York. Married Roland Hiram Beebe on 17 August 1898. 1880 US Census: Russell S. Wheeler, age 26 (b. NYS; parents b. NYS) and employed as a dry goods and grocery merchant, was heading a household in Wethersfield Township, Wyoming County, New York. The household also included his wife, Allie E. Wheeler, age 22 (b. NYS; parents b. NYS); daughter, Eunice M. Wheeler, age 9 months (b. Sep 1879); and brother, Edwin J. Wheeler, age 23 (b. NYS; parents b. NYS), single, and employed as a dry goods and grocery merchant. a. Donald Williston Beebe: See generation 2, below. Born 22 December 1900 in Arcade Township, Wyoming County, New York. Died 28 December 1982; interred Arcade Rural Cemetery, Arcade, New York. Middle name from his gr-gr-gr maternal grandparents, including Mary Williston (b. abt 1767 in VT/NH), see above. Had brown hair and blue eyes. Grew up in Arcade, Wyoming County, New York and graduated from Arcade High School. In 1923 graduated from the University of Buffalo Law School. Exempted from military service because he had had polio. Employed as an attorney in downtown Buffalo; worked his entire career in the same law firm, which, when the owner died, he took over; strictly family, estate, and real estate law - no divorces or criminal matters. Very active in the Unitarian Universalist Church, 695 Elmwood Avenue, Buffalo, serving as State Treasurer for a few years. About 1932 moved to Kenmore, Erie County, New York, where they resided on Argonne Drive. 1910 US Census: Donald W. Beebe [could be confused with "Bube"], resided in the household headed by his grandfather in the Village of Arcade, Arcade Township, Wyoming County, New York. 1925 NYS Census: Donald W. Beebe, age 24 (b. US), resided with his parents in Arcade Township, Wyoming County, New York. 1930 US Census: Donald W. Beebe, age 29 (b. NYS; parents b. NYS) and employed a lawyer in a law office, was heading a household at 822 Amherst Street in the City of Buffalo, Erie County, New York. He was married 1st at age 25. The household also included his wife, Margaret O. Beebe, age 29 (b. NYS; parents b. NYS). 1940 US Census: Donald W. Beebe, age 39 (b. NYS) and employed as an attorney in private practice, was heading a household at 373 Argonne Drive, Kenmore, Tonawanda Township, Erie County, New York. His home was valued at $9,000 and he had completed 3 years of college. He lived in the same house in April 1935. The household also included his wife, Margaret O. Beebe, age 40 (b. NYS), who had completed 4 years of college; daughter, Phyllis Beebe, age 8 (b. NYS); and son, Bruce Beebe, age 2 (b. NYS). Born 21 April 1900 in Victor Township, Ontario County, New York; daughter of Romeyn Thomas and Grace V. (Gourlay) Brace. Died 5 July 1990; interred Arcade Rural Cemetery, Arcade Township, Wyoming County, New York. Brown hair and blue eyes. Graduate of Victor High School (Valedictorian, but did not speak at her graduation because she was in the hospital for an unknown reason) and in 1923 graduated from Rochester University (Phi Beta Kappa; on scholarship), Rochester, New York. Subsequently employed as a school teacher in Arcade Township, New York until married. Married Donald Williston Beebe on 31 July 1926 at Farmington, Ontario County, New York. 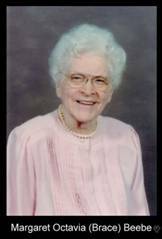 b. Phyllis Wheeler Beebe: (photos) Born 1931 at Buffalo, Erie County, New York. Graduated from Kenmore High School, Kenmore, Erie County, New York. In 1953 graduated from Cornell University, Ithaca, New York; BS degree. In 1958 graduated from the University of California (Berkeley), Berkley, California; PhD degree. Subsequently employed there as Professor of Immunology. Married Sidney Martin Blair (b. 1932 at Phoenix, AZ), son of Harry and Leontine MacAuliffe (Nolet) Blair in 1955 at Fresno, Fresno County, California. Sidney Blair graduated from Berkley High School, Berkeley, California and then from The University of California, Berkeley, eventually earning a PhD degree. Subsequently earned an MD degree from the University of California, San Francisco, specializing in psychiatry. Residency completed at the US Navy Hospital, Oakland, California. Rose to the grade of Captain in the US Navy and was a professor at the United Services University of Health Sciences, Bethesda, Maryland. Phyllis and Sidney did not have children. c. Bruce Addison Beebe: See generation 1, below. (a. Jessica Lynn Beebe: Born 1987 at Atlanta, Fulton County, Georgia. (b. Brian A. Beebe: Born 1989 at Atlanta, Fulton County, Georgia. Scott W. Beebe married (2nd), as her 2nd husband, Louise A. Douglas in 1998 in California. (a. Zachariah Dickeson: Born 1988 at Phoenix, Maricopa County, New York. (b. Amanda Rose Dickeson: Born about 1999. (3. Dawn Theresa Beebe: (photos) (adopted) Born 1981 at El Salvador, San Salvador. Married. (4. Linda Michelle Beebe: (adopted) Born 1983 at El Salvador, San Salvador. Married Kendrick T. (?). Born 1938 at Buffalo, Erie County, New York. Married Joyce Helen Rowell, generation 13, descendent # 1.1 of the Descendents of Charles Briant Drake, in 1960 at Buffalo. 1. Lothrop W. Beebe: Born about 1823 in New York. 1860 US Census: Lothrop W. Beebe, age 37 (b. NYS) and employed as a sawyer, was heading a household in Freedom Township, Cattaraugus County, New York. His real estate was valued at $700 and his personal property was valued at $210. The household also included his wife, Abigail Beebe, age 35 (b. NYS); son, Alanson Beebe, age 12 (b. NYS); daughter, Mariah Beebe, age 5 (b. NYS); and son, Clinton Beebe, age 1 (b. NYS). a. Alanson Beebe: Born about 1848 in New York. b. Mariah Beebe: Born about 1855 in New York. c. Clinton Beebe: Born about 1859 in New York.